Venerable Mahasi Sayadaw was born in the year 1904 at Seikkhun, a large prosperous village of pleasing appearance lying about seven miles to the west of historic Shwebo town in Upper Burma. His parents, peasant proprietors by occupation, were U Kan Taw and Daw Oke. At the age of six the Sayadaw was sent to receive his early monastic education under U Adicca, presiding monk of Pyinmana monastery at Seikkhun. Six years later, he was initiated into the monastic Order as a samaneraunder the same teacher and given the novice's name of Shin Sobhana, (which means Auspicious), a name that befitted his stalwart, impressive features and his dignified, serene behavior. He proved to be an apt and bright pupil, making quick, remarkable progress in his scriptural studies. When U Adicca left the Order, Shin Sobhana continued his studies under Sayadaw U Parama of Thugyi-kyaung monastery, Ingyintaw-taik, till the age of nineteen when he had to make a fateful decision in his young life whether to continue in the Order and devote the rest of his life to the service of the Buddha Sasana or to return to lay life. Shin Sobhana knew where his heart lay and unhesitatingly chose the first course. With due and solemn ceremony, he was ordained a full-fledged bhikkhu on the 26th day of November 1923, Sumedha Sayadaw Ashin Nimmala acting as his spiritual preceptor. Within four years of his ordination, the future Mahasi Sayadaw, now Ashin Sobhana, took in his stride all the three grades (lower, middle and higher) of the Pali scriptural examinations conducted by the Government. Ashin Sobhana next went to the city of Mandalay, noted for its pre-eminence in Buddhist learning, to pursue advanced study of the scriptures under Sayadaws well-known for their learning. His stay at Khinmakan West monastery for this purpose was, however, cut short after little more than a year when he was called to Moulmein by the head of the Taik-kyaung monastery, Taungwainggale (who came from the same village as Ashin Sobhana) to assist him with the teaching of his pupils. While teaching at Taungwainggale, Ashin Sobhana went on with his own studied of the scriptures, being specially interested in and making a thorough study of the Mahasatipatthana Sutta. His deepening interest in the satipatthana method of vipassana meditation took him then to neighboring Thaton where the well-known Mingun Jetawan Sayadaw's instructions, Ven. Sobhana took up intensive practice of vipasana meditation for four months with such good results that he was in turn able to teach it properly to his first three disciples at Seikkhun while he was on a visit there in 1938. After his return from Thaton to Taungwainggale (owing to the grave illness and subsequent death of the aged Taik-kyaung Sayadaw) to resume his teaching work and to take charge of the monastery, Ven. Sobhana sat for and passed with flying colors the Government-held Dhammacariya (Teacher of the Dhamma) examination in June 1941. On the eve of the Japanese invasion of Burma, Mahasi Sayadaw had to leave Taungwainggale and return to his native Seikkhun. This was a welcome opportunity for the Sayadaw to devote himself whole-heartedly to his own practice of satipatthana vipassana meditation and in turn to teach it to a growing number of disciples at Mahasi monastery, Ingyintaw-taik (whence the Sayadaw came to be known as Mahasi Sayadaw) at Seikkhun which fortunately remained free from the horror and disruption of war. It was during this wartime period that the Sayadaw was prevailed upon by his disciples to write his monumental Manual of Vipassana Meditation, an authoritative and comprehensive work expounding both the doctrinal and practical aspects of satipatthana method of meditation. It was not long before Mahasi Sayadaw's reputation as an able teacher of vipassana meditation spread far and wide in the Shwebo-Sagaing region and came to attract the attention of a devout and well-to-do Buddhist in person of Sir U Thwin who wanted to promote the Buddha Sasana by setting up a meditation center to be directed by a meditation teacher of proven virtue and ability. After listening to a discourse on vipassana meditation given by the Sayadaw and observing the Sayadaw's serene and noble demeanor, Sir U Thwin had no difficulty in making up his mind that Mahasi Sayadaw was the ideal meditation master he had been looking for. Eventually, on the 13th of November 1947, the Buddhasasananuggaha Association was founded at Rangoon with Sir U Thwin as its first President and scriptural learning and practice of the Dhamma as its object. Sir U Thwin donated to the Association a plot of land in Hermitage Road, Kokine, and Rangoon, measuring over five acres for erection of the proposed meditation center. In 1978, the Center occupies and area of 19.6 acres, on which a vast complex of buildings and other structures has sprung up. Sir U Thwin told the Association that he had found a reliable meditation teacher and proposed that the Prime Minister of Burma invited Mahasi Sayadaw to the Center. After the end of the Second World War the Sayadaw alternated his residence between his native Seikkhun and Taungwainggale in Moulmein. In the meantime Burma has regained her independence on 4th January 1948. In May 1949, during one of his sojourns at Seikkhun, the Sayadaw completed a new nissaya translation of Mahasatipatthana Sutta. This work excels the average nissaya translation of this Sutta which is of great importance for those who wish to practice vipassana meditation but need guidance. In November of that year, on the personal invitation of the former Prime Minister, Mahasi Sayadaw came down form Shwebo and Sagaing to the Sasana Yeiktha (Meditation Center) at Rangoon, accompanied by two senior Sayadaws. Thus began twenty-nine years ago, Mahasi Sayadaw's spiritual headship and direction of the Sasana Yeiktha at Rangoon (then in its initial stages of development without many appurtenances that grace it today). On 4th December 1949, Mahasi Sayadaw personally inducted the very first batch of 25 yogis into the practice of vipassana meditation. As the yogis grew in numbers later on, it became too strenuous for the Sayadaw himself to give the whole of the initiation talk. From July 1951 the talk was tape-recorded and played back to each new batch of yogis with a few introductory words by the Sayadaw. Within a few years of the establishment of the principal Sasana Yeiktha at Rangoon, similar meditation centers sprang up in many parts of the country with Mahasi-trained members of the Saŋgha as meditation teachers. These centers were not confined to Burma alone, but extended to neighboring Theravada contries like Thailand and Sri Lanka. A few such centers also grew up in Cambodia and India. According to a 1972 census, the total number of yogis trained at all these centers (both in Burma and aboard) had passed the figure of seven hundred thousand. In recognition of his distinguished scholarship and spiritual attainments, Mahasi Sayadaw was honored in 1952 by the then President of the Union of Burma with the prestigious title of Agga Maha-Pandita (the Exaltedly Wise One). Soon after attainment of Independence, the Government of Burma began planning to hold a Sixth Buddhist Council (Sangayana) in Burma, with four other Theravada Buddhist countries (Sri Lanka, Thailand, Cambodia and Laos) participating. For prior consultations for this purpose, Government dispatched a mission to Thailand and Cambodia, composed of Nyaungyan and Mahasi Sayadaws and two laymen. The mission discussed the plan with the Thathanabaings (Primates of the Buddhist Church) of these two countries. At the historic Sixth Buddhist Council, which was inaugurated with every pomp and ceremony on 17th May 1954, Mahasi Sayadaw played an eminent role, performing the exacting and onerous tasks of Osana (Final Editor) and Pucchaka (Questioner) Sayadaw. A unique feature of this Council was the redaction not only of the Pali Canon (canonical texts) but also of the atthakathas (commentaries) and tikas (sub-commentaries). In the redaction of this commentarial literature, Mahasi Sayadaw was responsible for his part for making a critical analysis, sound interpretation and skillful reconciliation of several crucial and divergent passages in these commentarial works. A significant result of the Sixth Buddhist Council was the revival of interest in Theravada Buddhism among Mahayana Buddhists. In the year 1955 while the Council was in progress, twelve Japanese monks and a Japanese laywoman arrived in Burma to study Theravada Buddhism. The monks were initiated into the Theravada Buddhist Saŋgha as samaneras (novitiates) while the laywoman was made a Buddhist nun. Next, in July 1957, at the instance of the Buddhist Association of Moji on the island of Kyushu in Japan, the Buddha Sasana Council of Burma sent a Theravada Buddhist mission in which Mahasi Sayadaw was one of the leading representatives of the Burmese Saŋgha. In the same year (1957) Mahasi Sayadaw was assigned the task of writing in Pali an introduction to the Visuddhi-magga Atthakatha, one that would in particular refute certain misrepresentations and misstatements concerning the gifted and noble author of this attakatha, Ven. Buddhaghosa. The Sayadaw completed this difficult task in 1960, his work bearing every mark of distinctive learning and depth of understanding. By then the Sayadaw had also completed two volumes (out of four) of his Burmese translation of this famous commentary and classic work on Buddhist meditation. At the request of the Government of Ceylon (now Sri Lanka), a special mission headed by Sayadaw U Sujata, a senior lieutenant of Mahasi Sayadaw, was sent to Ceylon in July 1955 for the express purpose of promoting satipatthana vipassana meditation. The mission stayed in Ceylon for over a year doing good work, setting up 12 permanent and 17 temporary meditation centers. Following completion of a specially constructed central meditation center on a site granted by the Ceylonese Government, a larger mission led by Mahasi Sayadaw himself left on 6th January 1959 for Ceylon via India. The mission was in India for about three weeks, in the course of which its members visited several holy places associated with the life and work of Lord Buddha, gave religious talk on suitable occasions and had interviews with Prime Minister Shri Jawaharlal Nehru, President, Dr. Rajendra Prasad and Vice President Dr. S. Radhakrishnan. An especially interesting feature of the visit was the warm welcome accorded to the mission by members of the depressed classed who had embraced the Buddhist faith under the guidance of their late leader Dr. Ambedkar. The mission enplaned at Madras for Ceylon on 29th January 1959 and arrived at Colombo the same day. On Sunday the 1st February, at the opening ceremony of the permanent central meditation center named Bhavana Majjhathana, Mahasi Sayadaw delivered an address in Pali after Prime Minister Bandaranayake and some others had spoken. Led by Mahasi Sayadaw, the members of the mission next went on an extended tour of the island, visiting several meditation centers where Mahasi Sayadaw gave suitable discourses on vipassana meditation and worshipping at various places of Buddhist pilgrimage like Polonnaruwa, Anuradhapura and Kandy. This historic visit of the Burmese mission under the wise and inspiring leadership of Mahasi Sayadaw was symbolic of the close and mutually beneficial ties (dating from ancient times) spiritual kinship between these two Theravada Buddhist countries. Its positive contribution to the welfare of the Buddhist movement in Sri Lanka was a steady revival of interest and activity in Buddhist meditation discipline, which seemed to have declined in this fraternal land of ours. In February 1954, a visitor to the Sasana Yeiktha would be struck by the spectacle of a young Chinese practicing vipassana meditation. The yogi in question was a young Chinese Buddhist teacher from Indonesia by the name of Bung An who had become interested in this kind of Buddhist meditation. Under the guidance and instructions of Mahasi Sayadaw and of the late Sayadaw U Nanuttara, Mr. Bung An made such excellent progress in about a month's time that Mahasi Sayadaw himself gave him a detailed talk on the progress of insight. Later he was ordained a bhikkhu and named Ashin Jinarakkhita. Mahasi Sayadaw himself acted as his spiritual preceptor. After his return as a Buddhist monk to his native Indonesia to launch a Theravada Buddhist movement in that country a request was received by the Buddha Sasana Council to send a Burmese Buddhist monk to promote further missionary work in Indonesia. It was decided that Mahasi Sayadaw himself, as the preceptor and mentor of Ashin Jina-rakkhita, should go. 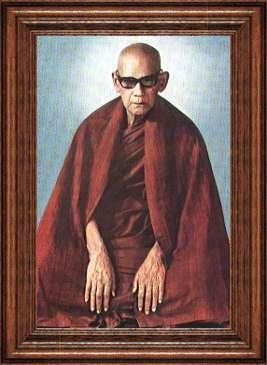 Along with 13 other monks from other Theravada countries, Mahasi Sayadaw undertook such essential missionary activities as consecrating sima's (ordinating boundary), ordaining bhikkhus, initiating samaneras (novices in the Buddhist Saŋgha) and giving discourses on Buddha Dhamma, particularly talks on vipassana meditation. Considering these auspicious and fruitful activities in the interests of initiating, promoting and strengthening the Buddhist movements in Indonesia and Sri Lanka respectively, Mahasi Sayadaw's missions to these countries may well be described as "Dhamma-vijaya" (victory of the Dhamma) journeys. As early as the year 1952, Mahasi Sayadaw at the request of the Minister in charge of Saŋgha Affairs of Thailand, had sent Sayadaws U Asabha and U Indavamsa to promote the practice of satipatthana vipassana meditation in that country. Thanks to the efforts of these two Sayadaws, Mahasi Sayadaw's method of satipatthana vipassana meditation gained wide currency in Thailand where many meditation centers had come into existence by about the year 1960 and the number of trained yogis had exceeded the hundred thousandth mark. On the exhortation of Abhidhaja-maharattha-guru Masoeyein Sayadaw who headed the Saŋghanayaka Executive Board at the Sixth Buddhist Council, Mahasi Sayadaw had undertaken to teach regularly Ven. Buddhaghosa's Visuddhi-megga Atthakatha and Ven. Dhammapala's Visudhi-megga Mahatika to his Saŋgha associates at the Sasana Yeiktha. These two commentarial works of the Theravada School deal in the main with Buddhist meditational theory and practice, though they also offer useful explanation of important doctrinal points in Buddha-vada. They are thus of the utmost importance for those who are going to be meditation teachers. In pursuance of his undertaking, Mahasi Sayadaw began teaching these two works on 2nd February 1961 and for one and one-half to two hours a day. On the basis of notes of his lectures taken by his pupils, Mahasi Sayadaw started writing his nissaya translation of Visudhi-megga Mahatika and completed it on 4th February 1966. The production of this nissaya translation was an exceptional performance on the part of Mahasi Sayadaw. The section on samayantara (different views held by other religions or faiths) formed the most exacting part of the Sayadaw's task in producing this work. For tackling this part, the Sayadaw had to, among other things, familiarize himself with ancient Hindu philosophical doctrines and terminology by studying all available references, including works in Sanskrit and English. Mahasi Sayadaw has to his credit up till now 67 volumes of Burmese Buddhist literature. Space does not permit us to list them all here, but a complete up to date list of them is appended to the Sayadaw's latest publication namely, A Disclosure on Sakkapanha Sutta (published in October 1978). At one time, Mahasi Sayadaw was subjected to severe criticism in certain quarters for his advocacy of the allegedly unorthodox method of noting the rising and falling of the abdomen in vipassana meditation. It was mistakenly assumed that this method was an innovation of the Sayadaw on his own, whereas the truth is that it had been approved several years before Mahasi Sayadaw adopted it, by no less an authority than the mula (original) Mingun Jetavan Sayadaw, and that it is in no way contrary to the Buddha's teaching on the subject. The reason for Mahasi Sayadaw's preference for this method is that the average yogi finds it easier to note this manifestation of voyo-dhatu (element of motion). It is not, however, imposed as an obligatory technique upon any yogi who comes and practices meditation at any of the Mahasi yeikthas (meditation centers). Such a yogi may, if he likes and if he finds that he is better accustomed to the anapana way (observing the inbreath and outbreath), meditate in this latter mode. Mahasi Sayadaw himself refrained from joining issue with his critics on this point, but two learned Sayadaws brought out a book each in defense of Mahasi Sayadaw's method, thus enabling those who are interested in the controversy to weigh and judge for themselves. This controversy was not confined to Burma alone, but arose in Ceylon also where some members of the indigenous sangha, inexperienced and unknowledgeable in practical meditational work, publicly assailed Mahasi Sayadaw's method in newspapers and journalistic articles. Since this criticism was voiced in the English language with its worldwide coverage, silence could no longer be maintained and the late Sayadaw U Nanuttara of Kaba-aye (world Peace Pagoda campus) forcefully responded to the criticisms in the pages of the Ceylonese Buddhist periodical "World Buddhism". Mahasi Sayadaw's international reputation and standing in the field of Buddhist meditation has attracted numerous visitors and yogis from abroad, some seeking enlightenment for their religious problems and perplexities and others intent on practicing satipatthana vipassana meditation under the Sayadaw's personal guidance and instructions. Among the earliest of such yogis was former British Rear Admiral E. H. Shattock who came on leave from Singapore and practiced meditation at the Sasana Yeiktha in 1952. On his return home to England he published a book entitled "An Experiment in Mindfulness" in which he related his experiences in generally appreciative terms. Another such practitioner was Mr. Robert Duvo, a French-born American from California. He came and practised meditation at the Center, first as a lay yogi and later as an ordained bhikkhu. He has subsequently published a book in France about his experiences and the satipathana vipassana method of meditation. Particular mention should be made of Anagarika Shri Munindra of Buddha Gaya in India, who became an anterasika (close) disciple of Mahasi Sayadaw, spending several years with the Sayadaw learning the Buddhist scriptures and practising satipatthana vipassana (insight) meditation. He now directs an international meditation center at Buddha Gaya where many people form the West have come and practised meditation. Among these yogis was a young American, Joseph Goldstein, who has recently written a perceptive book on insight meditation under the name "The Experience of Insight: A Natural Unfolding". Some of Sayadaw's work have been published abroad, such "The Satipatthana Meditation" by the Unity Press, San Francisco, California, U.S.A., and the "Progress of Insight" by the Buddhist Publication OVADACARIYA Society, Kandy, Sri Lanka. Selflesss and able assistance was rendered by U Pe Thin (now deceased) and Myanaung U Tin in Sayadaw's dealings with his visitors and yogis from abroad and in the translation into English of some of Sayadaw's discourses on vipassana meditation. Both of them were accomplished yogis. The inexorable law of Anicca (Impermanence) terminated, with tragic suddenness, Mahasi Sayadaw's selfless and dedicated life on the 14th day of August 1982.